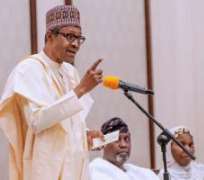 Nigeria president Muhammadu Buhari has asked Nigerians not to approach the 2019 general elections with fear, saying it’s not a 'do or die' affair. Buhari used the occasion to urge opposition candidates and political parties to desist spreading falsehood for political gains in the election year. “We are on this mission together, and I assure you of a firm commitment to the ideals of a safe, secure, fair, just and prosperous country,” Buhari said. Buhari, who campaigned on three focal points of security, economy and fight against corruption in 2014, expressed optimism that his government will prevail its challenges since elected in 2015.